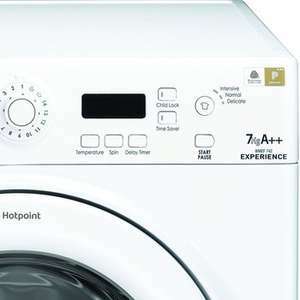 The Hotpoint WMEF742 is a fantastic product offering superb energy A+++ efficiency which is great when saving the pennies. It features a 7KG drum ideal for the larger family and a 1400 maximum spin speed to get the garments as moisture free to make your drying cycle shorter. It also features a quick programme for when you are in a hurry and is fully endorsed with the Woolmark 'platinum care' programme to reduce the friction between your clothing. Would recommend extending the warranty on this one. Hotpoint aren't great machines. They are made by same company that makes Indesit and spec are similar. The plastic paddles inside the drum broke off on ours within a month of buying it and they refused a repair under warranty, saying that the damage had been caused by a coin or an item of clothing. Had to pay for them to fix it. Needless to say I would not purchase another Hotpoint/ Indesit machine. Reference the paddles - They will only occasional come off if hit repeatedly, many, many times by heavy trainers. Usually its caused by a foreign object getting in between the drums from clothing pockets - the foreign object smashes the fixings for the paddles and then eventually they come off. My washer is about 8 years old and I have never had to touch anything on my hotpoint. Look after it and it will look after itself. Example - I pulled a small cup full of coins out of a sump and the customer said that they were not hers. Reference the paddles - They will only occasional come off if hit … Reference the paddles - They will only occasional come off if hit repeatedly, many, many times by heavy trainers.Usually its caused by a foreign object getting in between the drums from clothing pockets - the foreign object smashes the fixings for the paddles and then eventually they come off.My washer is about 8 years old and I have never had to touch anything on my hotpoint. Look after it and it will look after itself.Example - I pulled a small cup full of coins out of a sump and the customer said that they were not hers. they're mine then. Do you need my bank details so you can transfer them? Is there any water inside the machine? Read the reviews on Hotpoint machines before buying one. I wish I had because I definitely would have gone for a different make had I done so. Are you unable to see the comments posted above?